As aspiring artisans we have an undeniable urge to create beauty. Mastery of a craft is a journey of a lifetime. It makes sense that if we love this craft of building and we aspire to reach its mastery, we should strive to maintain a healthy, strong and agile body that will support us. There is a marked difference in the body of an elderly Japanese craftsman and the aging American builder. In Japan, we witnessed elderly craftsmen working on the floor, using both arms and both legs, their fingers and toes, limber and adept. Ask any builder over 40 in America is they have back problems, and you will almost always hear a long tale of woe. Have you seen a professional athlete compete without first warming up? Have you ever seen a builder warm up before starting a day of hard physical labor? Building involves a balance of physical and mental work. Lesson number one that we teach our students is mind/body awareness. We do warm-up excercises each morning. We focus our minds and create limber bodies so that the building activities bring strength and not the eventual injury that is inevitable when hard physical activity is performed without awareness. The worksite is quiet, clean, and respectful of the business at hand. It is a safe environment in which to do our best. Comradery runs high as friendships are forged. 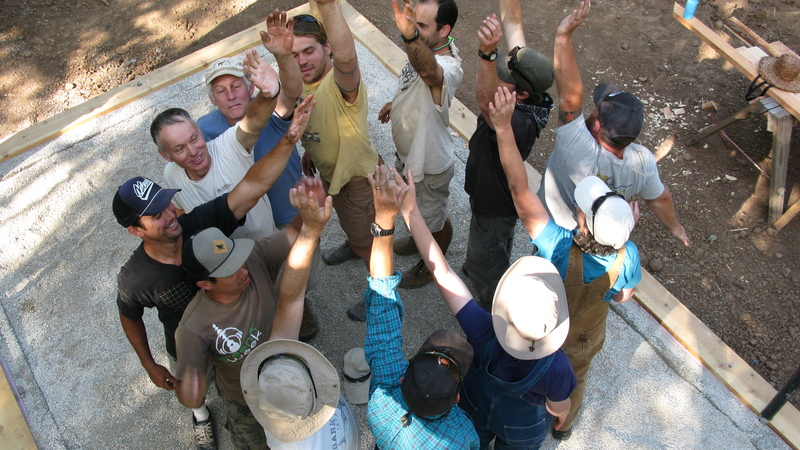 The EcoNest workshop training is designed to awaken craftsmanship, build teamwork and inspire leadership. The teachers are clay, straw, and timber.